There are few things quite as exhilarating as driving a muscular sports car on a track. Driving on the open road or through winding mountain roads can be great, but pushing a beast like the Mustang Boss 302 around the tight turns of a racetrack and then flooring it on the straightaway will give you a thrill you’ll never forget. 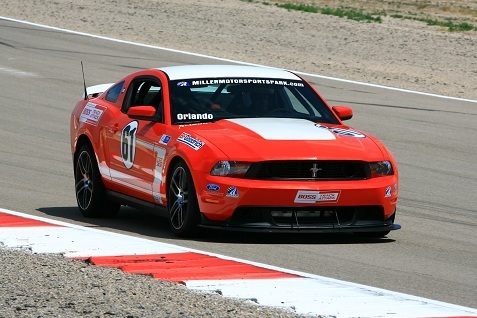 We naturally jumped at the chance to participate when Ford invited us to its first “Mustang Masterclass – Something Every Man Should Know” event for the opportunity to drive the 2013 Mustang Boss 302 at Miller Motorsports Park. The idea was to teach us how to drive this incredible muscle car on a track regardless of our skill level. I was pretty comfortable driving a stick but was anxious to learn more from some of the best driving instructors in the country, and I wasn’t disappointed. The Mustang is one of the most iconic American nameplates, and the Boss 302 is a special version of the Mustang that was born on the track. The first generation Mustang Boss 302 was made from 1969-1970 specifically for buyers who wanted to race their Mustangs, and it was revived in 2012 for the same purpose. Most importantly, the new Boss features a beast of an engine that yields 444 horsepower and 380 lb.-ft. of torque. The Boss mandate is to provide the best-handling Mustang ever, so the already strong Mustang GT suspension system has been further refined. The Boss 302 also features unique, lightweight 19-inch black alloy racing wheels in staggered widths: 9 inches in front, 9.5 inches in the rear. The result is an incredible machine with a growl that will turn heads and bring a smile to your face. Miller Motorsports Park was about 30 minutes away from our hotel, so we loaded up on some coffee and were greeted by a fleet of colorful 2013 Mustang Boss 302s that we would be driving to the track. From a design point of view, one minor change stands out this year involving the side stripes. The 2012 version featured a reflective “c-stripe” on the side of the vehicle inspired by the 1969 model, and the 2013 Ford Mustang Boss 302 builds on the heritage of the 1970 Boss 302 with new, reflective “hockey stick” graphics package. The LED lights in the front and back also stand out. We hopped in and revved up the engines and were off. 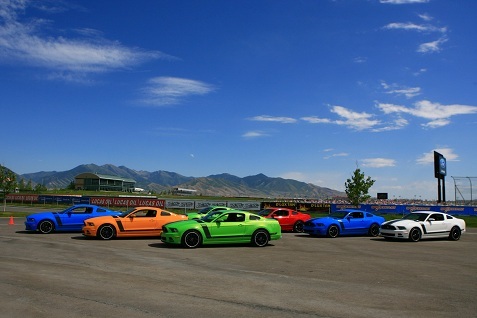 This gave us a preview of what we were in for at the track as we cruised through the Utah countryside. The Boss 302 may be built for the track, but you’ll have plenty of fun driving this beautiful vehicle in any setting. When we arrived at the track we settled in for some serious classroom work. The goal here was to teach us how to drive on a race track, and the instructors were extremely knowledgeable and safety was always the number one goal. A lot of time was spent on the proper line to take going in and out of turns, focusing on the apex and the entry and exit points. It was fascinating stuff and it also turned out to be extremely helpful. We got suited up in our racing suits and helmets, and then we headed out to the garage to find our cars. The good folks at Miller had each of our names put on the windshield of our car and it was quite a thrill to climb into a personalized Boss 302 racecar. Mine was orange, though later in the day they switched me into the #57 black car. The track cars had thick safety bars in the interior like you’d find in all race cars. We went through some test laps and then we had some specific lessons on braking and downshifting, and then we were ready for some high-speed laps. When we got back on the track, the instructor always set the pace in the lead white car with blue stripes with three of us following in our 302s, and following the instructor’s line on the track was a huge help. I was lucky to be in the fastest group, and our instructor really challenged us to keep up. The car was a pure joy to drive and it handled beautifully, and the power on the straightaways and coming out of turns was amazing. I could have spent the whole day in that car. The entire experience was amazing. We enjoyed many more activities that day at Miller in between our track times, including go-cart racing and zip lining. I’ll follow up with a separate article on all the activities available at Miller Motorsports, but the highlight was the Mustang Boss 302 and taking it out on the track. People from all over the world come to Miller to work with the instructors to improve their driving skills over several days, and we got a very good taste of that experience. As I was driving back to the hotel, I was stuck behind a truck on a two-lane road so I floored my Mustang Boss 302 and easily blew by it. It was a nice reminder that I didn’t need to be on a track to enjoy this car, but I still can’t wait to do it again.